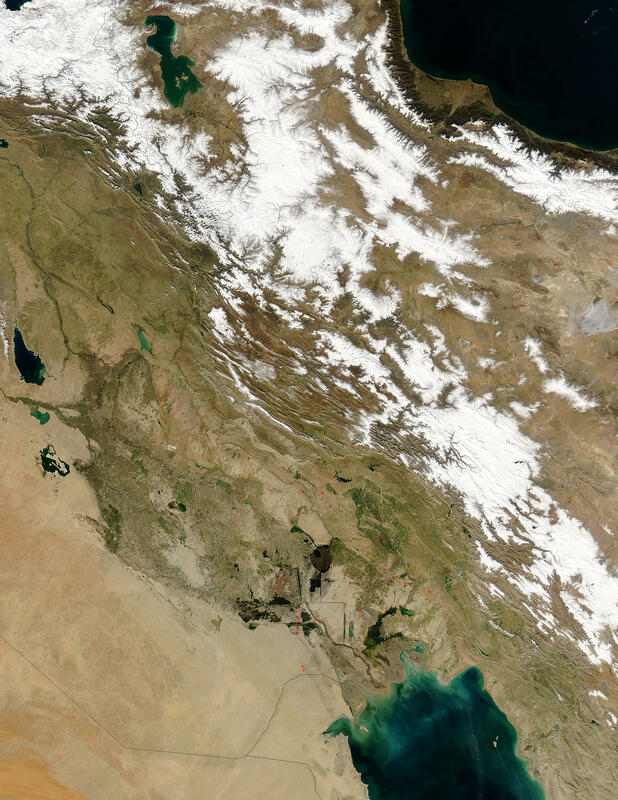 Winter rains and possibly melting snow from Iran’s Zagros Mountains have begun to fill the marshes and shallow lakes of Southern and Eastern Iraq. Flooding in this region is an annual affair, though typically, the floods peak in April and May when spring snowmelt flows out of Iran. This Moderate Resolution Imaging Spectroradiometer (MODIS) image shows that water levels had already begun to rise two months in to the rainy season. Winter rains usually run from December to April, and this image was acquired by the Aqua satellite on February 8, 2004. The mountains in Iran are still capped with snow, which is light blue in the false-color image. Iraq’s marshlands are divided into three by the Tigris River in the north and the Euphrates River in the south. The two rivers converge to form the Shatt al Arab, which flows into the Persian Gulf. On the western banks of the Shatt al Arab, south of the Euphrates River, is the Hammar marsh. A black pool of dark water, Lake Hammar, dominates the marsh in this image. Directly north of the Hammar marsh, between the “v” formed by the Tigris and Euphrates Rivers, is the Qurnah or Central marsh. During the 1990s, much of the water that fed this marsh was diverted away by dykes and earth barriers in a campaign to control the livelihood of Marsh Arabs living in the region. After the fall of Iraqi leader Saddam Hussein, the dykes and barriers were removed. The third marshland, the Hawizeh marsh, sits on the Iran-Iraq border, east of the Tigris River. Floods in the marshlands have already caused problems this year. In early January, rediverted water combined with heavy rains caused intense floods near Nasiriya, a little north of Lake Hammar on the shores of the Euphrates River. Over 8,000 people were evacuated, and at least 180 houses were destroyed. In the false-color image, water is dark blue or black, snow is light blue, vegetation is bright green, and bare soil is pink and tan. Red dots mark the locations of active fires. A true-color image of this scene is also available.